Technology is moving forward, in order to make the work more short and easy for mankind, it depends on many technologies. So now it is not necessary to make unnecessary trouble in making coffee, making machines made by making coffee, and not only in this world, but also in space research, this technology is a matter of daily concern. Yes, you are right; We're talking about a specialized technology that has little to do today around the world. And that is the robotics. Although this word is very old, people working in robotics in our country are still much less. But since the technology is going forward, we also, and we are using this technology, so the time has come for us to work on this robotics, to work on this country in an invincible talent, to encourage young people, the Robotics Foundation is working from its beginning . 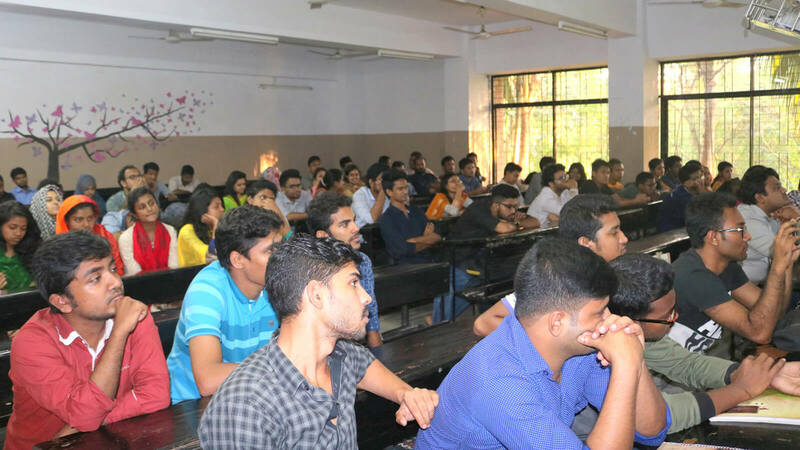 On November 05, the seminar was organized by the Department of Computer Engineering at the University of Jahangirnagar University and with the assistance of the Bangladesh Robotics Foundation. Professor of Computer Engineering Department of the University was present as the guest of the seminar. Md. Imdadul Islam and the seminar were conducted, Md. Rafsan is known to be the lecturer, Department of Computer Science and Engineering, Jahangirnagar University. 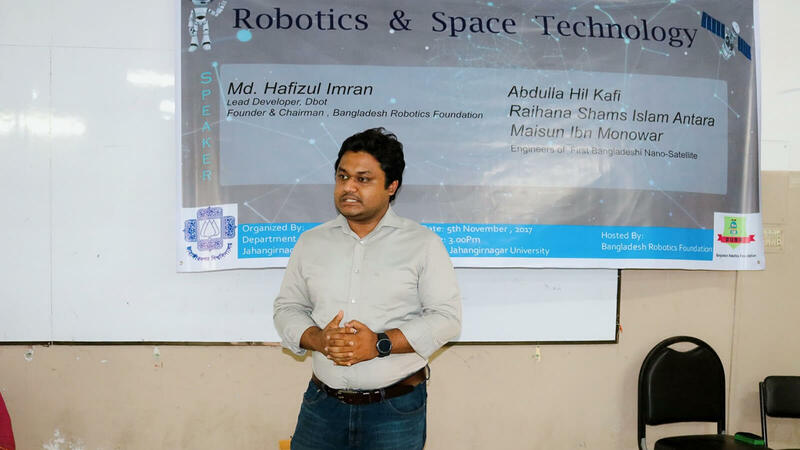 At the first stage, the founder and chairman of the Bangladesh Robotics Foundation, Mohammad Hafizul Imran, who achieved fame by creating human shape robots in the country, needed the concept of robots in the present world, basic concepts of different types of robots, the use of robots, as well as the introduction of robot designs and robots. Theoretical and practical information about the steps Give it. He also discussed the details about his designated D-boat robot. At the end of his speech, everyone urged to work with the Robotics Foundation. 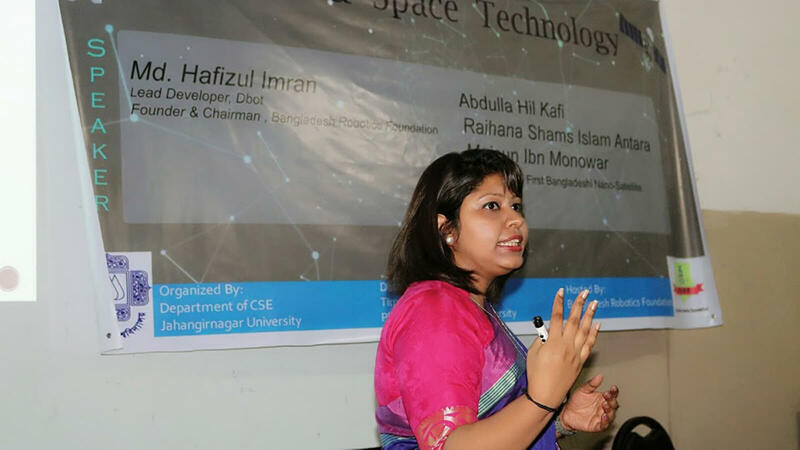 In the second phase of the event, detailed explanation about space technology and the first Nano satelite "BRAC Annasa" made in Bangladesh, two members of the inventor of the Nano satellite, Abdullah Heil Kafi and Raihana Shams Islam Antara, discusses details of how to launch a satellite from the beginning. Members of this team. They carry out satellite research in Bangladesh Want to go with the young students of the country to create a satirical question, after the satellites in domestic technology, the answer is organized. In this episode the speaker answered the questions of robot and aerospace technology and various questions related to the students. Finally, the members of Bangladesh Robotics Foundation displayed various robots in the seminar. The Bangladesh Robotics Foundation is optimistic about how the young generation can be introduced to the technology in the coming days, and working on how they can be made efficient. Because if we are lagging behind information and technology, we will not only be backward in the near future, but by using the technology of others, we may be able to come in their enclosures.